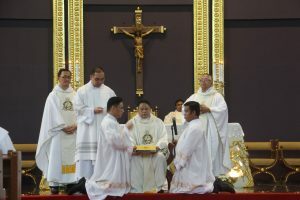 Mira-Nila Homes, QUEZON CITY— Despite the supertyphoon Ompong devastating the northern part of the Philippines, the Order of Augustinian Recollects in the Philippines celebrated the scheduled Solemn Profession of Vows of seven friars at the Our Lady of Consolation Parish last September 15, 2018. 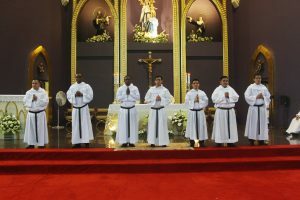 Those who made their definitive ‘yes’ to God and incorporation to the Order were: Fray Jorr Rabacal, OAR, Fray Benjamin Monday Edobor, OAR, Fray Maximillian Ifeanyichukwu Omem, OAR, Fray Jovy Gallego, OAR, Fray Andrie Pugate, OAR, Fray Tomokatsu Yamaguchi, OAR, and Fray Jessriel Marcha, OAR. 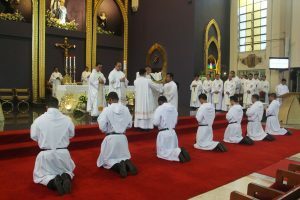 Presiding the Holy Sacrifice of the Mass and the rite of of the Solemn Profession was Rev. Fr. 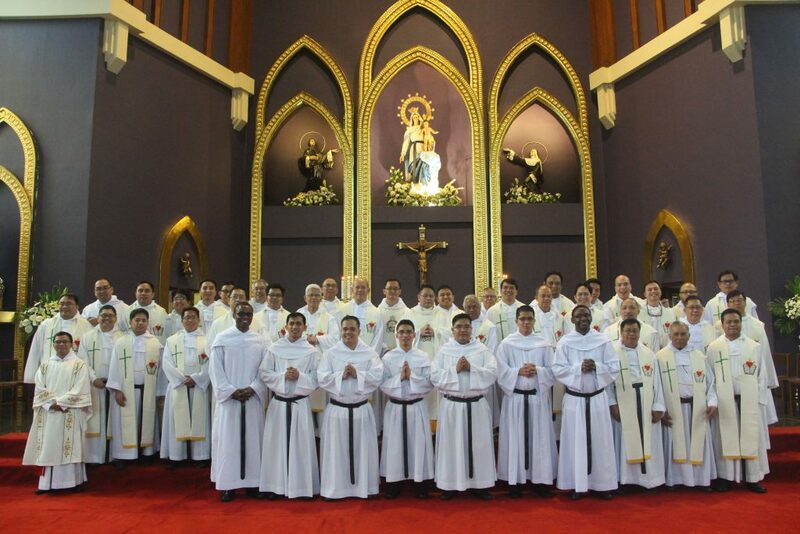 Dionisio Q. Selma, OAR, Prior Provincial of the Province of St. Ezekiel Moreno. 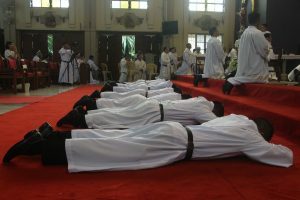 Among the other concelebrating priests were Rev. Fr. 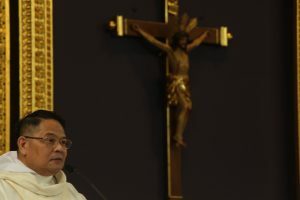 Lauro Larlar, OAR, prior/rector of the Recoletos Formation Center, and Rev. Fr. Kenneth Joseph Onda, OAR, Master of the Professed. 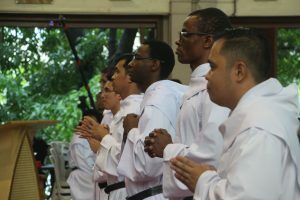 Two deacons, Rev. 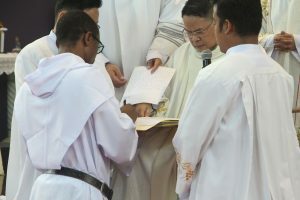 Keneth Pahamutang, OAR and Rev. 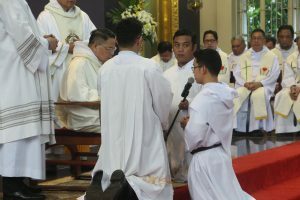 Paul Demiliones, OAR, assisted in the altar. 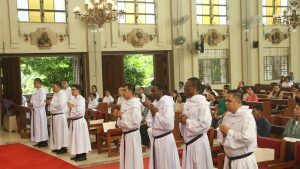 In his homily, the Prior Provincial exhorted the candidates to recall their personal encounter with God and the moment they responded to His calling. Further, he admonished the candidates relative to the imminent challenges and difficulties lurking in their chosen path. He also consoled them not to back out but persevere instead for they have the Word of God to depend on. Fr. 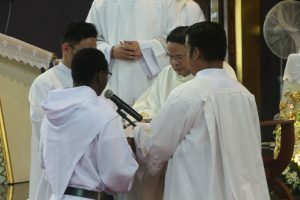 Selma reminded them not to fear because God “sends persons as instruments to guide us.” Delivering the message of gratitude on behalf of the newly-professed was Fray Tomokatsu Yamaguchi, OAR.